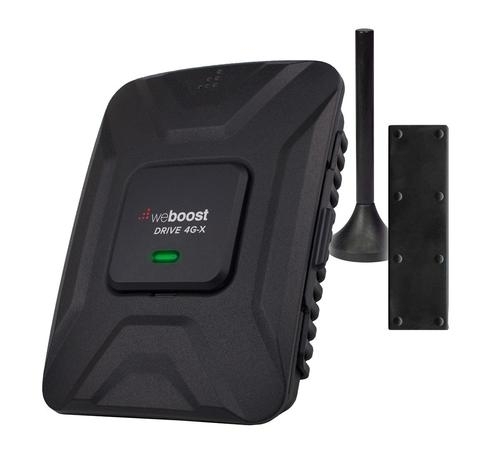 The weBoost Connect RV 65 cellular signal booster is a simple, effective solution to significantly improve the cellular signal strength within any RV. This mobile signal booster system provides a benefit for all users on all cellular-enabled devices on all carriers while in your parked vehicle. By using the Connect 65 from weBoost, you can stay connected to receive important messages or updates, even when you’re far away from home. Included in the RV repeater kit is a telescoping pole that can extend up to 25 feet tall. This allows the outside directional cellular antenna to maximize the signal from the nearest cell tower. Initial installation of the weBoost Connect 65 for RV takes approximately 30 minutes. Once you’ve done this, only 10 minutes are needed to set up and take down the pole and outside antenna whenever you’re parked. Note that this repeater is not designed to be used when your RV is in motion. 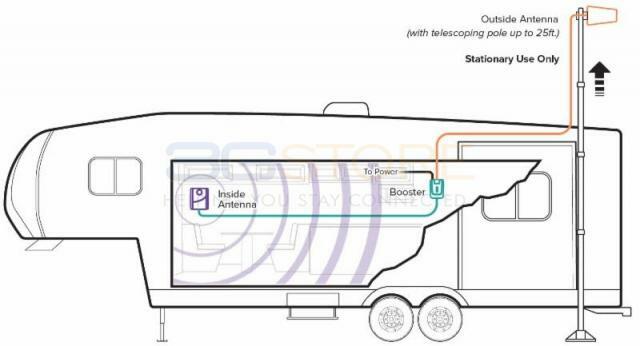 The Connect RV 65 uses a powerful 5-band cellular signal booster to provide maximum signal inside your RV. If you have any sort of signal, this repeater will increase it, making signal more usable even when used in weak cell phone signal areas. weBoost cellular signal boosters improve data speeds as well — including 4G LTE — on most cellular carriers in the United States. The Connect RV 65 comfortably handles multiple simultaneous connections across multiple carriers, providing effortless cellular voice and data communications for all users. weBoost’s Connect RV 65 Repeater Kit comes with a two-year manufacturer’s warranty. You’ll also receive a year of free technical support from 5GStore.com, which includes a full installation guide in our support portal. Use it to stay connected to the world whenever you’ve reached your weekend getaway destination. If your signal is extremely poor (-108db or worse), an amplifier may not be effective - there must be some usable signal available for the amplifier to boost. Conversely, if the signal is too STRONG at your location (-50db or better), the amplifier may shut down to avoid interference with the tower. How it works: The outside antenna picks up the cellular signal and sends it through the first cable to the amplifier. The signal is then boosted and sent through the second cable to the inside antenna, which rebroadcasts the boosted signal. 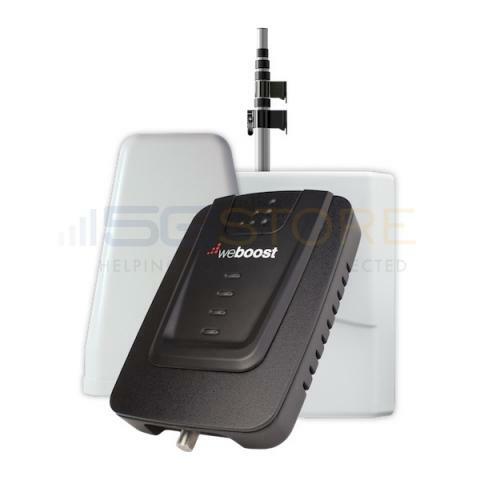 All of your modems/phones within range of the inside antenna can benefit from the boosted signal wirelessly. *Many factors will influence the actual coverage area you will see from a repeater, including layout/floorplan, construction, and original un-amplified signal strength. Depending on your situation, you may see more or less coverage than the estimates listed here. It is not possible to guarantee coverage area. This kit is NOT to be used while in motion. In order for your system to function properly, you must maintain adequate separation between the yagi and panel antennas (if the antennas are too close together, there will be oscillation/feedback between the antennas and the amplifier will shut down). This amplifier requires approximately 15' of separation between the outside and inside antennas. Separation can be horizontal or vertical. If you cannot achieve adequate separation to eliminate oscillation, you can turn down the gain on the amplifier, but that will result in a smaller coverage area from the amplifier. The yagi antenna must be aimed at the cell tower - if it is not aimed properly, it will not be effective. Make sure the interior panel antenna is aimed AWAY from the outside antenna.